The Araxi Longtable Dinners are British Columbia’s most exciting al fresco dining experiences – and this summer, Whistler’s Araxi Restaurant will add a Vancouver date at the famed Bard on the Beach venue at the picturesque Vanier Park. And the menu has just been announced! 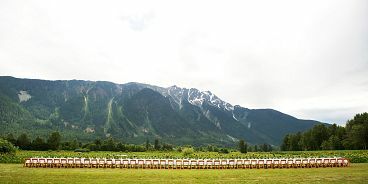 Staged at North Arm Farm in Pemberton and Lost Lake in Whistler in past summers, these sold-out events embraced our extraordinary local ingredients picked at the peak of the season. Guests have the opportunity to meet the suppliers who raise the produce, and at North Arm Farm, tour the organic fields where, only hours earlier, the ingredients were harvested just steps away from the outdoor kitchen. New this year, the inaugural Longtable Dinner in Vancouver will be the largest dinner to date and will provide a dramatic oceanside setting. Araxi’s award-winning executive chef James Walt leads the charge and as a special treat, welcomes his Vancouver-based Toptable Group counterparts Andrew Richardson from CinCin, Frank Pabst from Blue Water Cafe, Quang Dang from West, and Thierry Busset from Thierry Chocolaterie Patisserie and Cafe for guest appearances. Presented in striking outdoor settings, Chef Walt crafts exclusive four-course menus that showcase his internationally recognized farm-to-table creations. With wine pairings by Araxi wine director Samantha Rahn, 2013 Sommelier of the Year, and service orchestrated by renowned restaurant director Neil Henderson, the Longtable Dinners salute both our culinary provenance, and our future. Tickets are $175.00 per person per event and include a welcome reception, four-course menu, wine pairings, and tax and gratuity. The Longtable Dinners sell out quickly. For reservations or further information, please email longtable@araxi.com or call 604-932-4540.